The shop at home flooring model as opposed to storefronts. Which is better? Well, when I first started selling flooring back in 1977, there really wasn't any shop at home style of flooring store. We all worked retail hours (long hours, yikes) in a retail store format. Customers came in, picked out the flooring they liked and usually bought it. Sometimes customers would like to see the flooring in their homes (which was a really good idea) so we would take out some of their choices and see how they looked in the home. While we were there, we would measure the areas they wanted covered and inspect the job site. When I went out on my own in 1997, I asked myself "what would be the best way to serve customers and keep my prices down?" I knew that seeing the flooring samples in the house was absolutely the best way to make the right flooring choice. Especially for colors. Colors can change shade for so many reasons. So, seeing the flooring samples in the home had to be the cornerstone of the service I would provide. Another benefit to a "Shop at Home" style of store would be low overhead. Low overhead allowed me to keep my prices down. This would save my customers money (another good thing, eh?). One drawback to "shop at home" was the perceived idea that stores could carry a larger selection of flooring. So a "shop at home" store wouldn't be able to offer the selections that a store front could. There is a very well known company that has only 15 styles of carpet that they bring out (I won't mention any names but you know who you are......). Their selection is very limited. We here at Dover Floor Covering carry over 75 different styles of carpet, the whole Mohawk hardwood flooring line, the whole Mohawk laminate flooring line, Congoleum's vinyl and just a few (15 maybe) styles of ceramic tile (the main reason for this is that ceramic weighs so much that it weighs my van down....lol). Another way to combat the perception that a "Shop at Home" floor covering store doesn't have the selection is to have a couple of flooring distributors on hand. There are very rare times (and it really is very rare) that we don't have a flooring selection that the customer really likes. When this happens we will visit our flooring distributors. They have every flooring selection available under the sun. They will have up to 4 times the selection of a retail flooring store! After ascertaining exactly what style, color and type of flooring our potential customer wants, we will visit our distributor and find a couple of choices that will match their preferences exactly. We will then go back out to our customers house with the new selections. This will invariably do the trick 99.5% of the time. So now we have low overhead, unlimited selections and fantastic customer service. After all, who makes house calls these days? So if the "Shop at Home" flooring store model has the lowest overhead equating to the lowest prices (95% of the time anyways.....), unlimited selection and unparalleled service (being in your own home where you will see the flooring in it's natural lighting and not under fluorescent lights) then we think it is the absolute best method of shopping for flooring. With the recent hub bub surrounding Lumber Liquidators and some of the laminate flooring they sell containing toxic amounts of formaldehyde, we are pleased to announce that the Mohawk laminate flooring that we sell at Dover Floor Covering is Carb 2 compliant. The recent 60 Minutes expose on Lumber Liquidators exposing the toxic amounts of formaldehyde found in most of their laminate floors has caused concern in the industry regarding the safety of laminate floors. 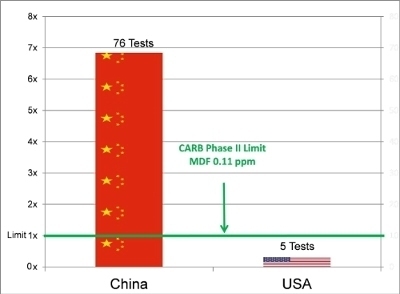 Only the floors made in China failed the Carb 2 tests. The US constructed floors passed the Carb 2 tests. As you can see by the image to the right, some of the laminate flooring has almost 7 times the legal limit of formaldehyde in their flooring. Not all laminate floors are created equal. The old saying of "You get what you pay for" is appropriate in this situation. Some of the really low low end priced floors have always been of dubious construction. Some of these floors were sold at below our cost and you had to ask yourself "How was this possible?" Now, there are always economies of scale. The larger amounts of flooring you buy on the wholesale level will always produce a slightly lower cost structure. But this never completely explained why Lumber Liquidators prices were always "so low"! We knew there had to be another reason explaining how they could sell laminate flooring below cost. If the expose by 60 Minutes is accurate (and we have no reason to dispute their findings) then our concerns have been justified. Not all laminates are created equal but all of the laminate flooring that we sell here at Dover Floor Covering manufactured by Mohawk Flooring is Carb 2 compliant. No toxic amounts of formaldehyde are present in their laminate products and no laminate flooring we sell fails any Carb 2 Compliance test. It would be safe to ask for a Carb 2 compliant fact sheet from the retail flooring company that you plan to buy your laminate flooring from. This is just smart. Be smart, be safe. Safe laminate flooring should be a no brainer but some unscrupulous flooring companies obviously don't share this concern. We do! Purchase only Carb 2 compliant laminate flooring and only buy from flooring companies that adhere to this principle. Companies that actually care about the safety of their customers.